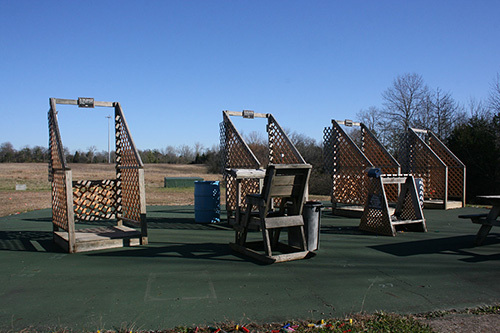 Five Stand (aka 5 Stand), is a clay target game that is fun and a challenge to any shot gunner. 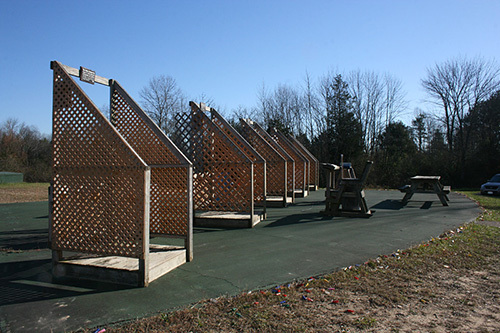 The game consists of 5 different shooting stations arranged in line with each other. The game starts with up to 5 shooters; one at each station. Each shooter gets to shoot at 5 different target presentations from each station. A full round consists of 25 targets per shooter. There are usually somewhere between 6 and 8 traps that throw targets. Each throws a clay target in a unique presentation that simulates running rabbits to springing teal. Targets are also thrown in incoming, outgoing, quartering-away, quartering-in and other angled patterns. The number one tip when shooting a shotgun is to keep your face on the gun! When shooting a shotgun, the gun always follows your eyes (which are on your face), and even a small gap from the gun to your face translates to inches, if not feet, missed from the impact point on the target. The other reason is for safety. If the gun is not firm on your face just below your cheek bone, the recoil can kick the gun up to your face and cause some pain. The next tip is keep the balance of your weight on your front foot. This is important in any kind of shooting, especially when shooting a shotgun. Number three is keep the gun swinging. Unlike rifles or pistols, a shotgun has to be moving at all times. The target is moving, so the gun must also.